It is no surprise that the Catholic Church has always been against communism. In the early 20th century in places like Mexico, Russia and Spain, communists had persecuted the Catholic faithful, destroyed churches and killed clergy. Of course the principal reason for the church’s opposition was that communism was an atheistic ideology; ‘Godless communism’ became central to the vocabulary of anti-communism. "Going back decades, American Catholics were very concerned about the fate of Catholics abroad within the communist bloc, and had spoken up against the oppression of Catholics - for obvious reasons really, they saw communism and Catholicism as deeply opposed", explains Professor Hugh Wilford from California State University. "It was a major concern and there was a very strong tradition of anti-communism within the Catholic community." Leading Irish-American Catholic churchmen and intellectuals opposed US government recognition of the USSR in 1933, as well as the alliance with the Soviet Union during the Second World War. However, in the geopolitical shakedown following the war, American foreign policy was suddenly highly suspicious of the USSR and its expansionist ambitions. Communism was perceived as a major threat to world peace and a threat to the American dream. "In the wake of the Korean War in particular, the American population and the Government had good reason to fear communist infiltration and the power of Soviet infiltration in newly emerging states in the post war world", says Dr Kate O’Malley from the Royal Irish Academy. "What you have is an American people primarily devout and religious - protestant, Catholic and Jewish - who had a common spirituality. Whereas communism was godless - and it was this atheism that feared them the most." "With the advent of the Cold War, suddenly all of American society is anti-communist", adds Wilford. "And American Catholics, who perhaps had previously struggled to assert their Americanism, now are the most American of all Americans because they are anti-communist. What had been a minority concern is now shared by the whole society." "What happened is that Irish-American Catholics became ultra-patriotic because their church had a common ideology with their government", says O'Malley, "and now they wore their Catholicism almost as a badge of honour." The CIA earned itself nicknames like "Catholic Intelligence Agency" and "Catholics In Action." The Cold War provided an opportunity for anti-communist Catholics to get some airtime and influence in the national media and influence the national conversation. "It’s almost as if this moment was made for these anti-communists", says Wilford, "and suddenly people who had been quite marginal come to the fore. American Catholics are natural Cold Warriors." "They were the backbone of American anti-communism in this period, and so they are coming out of the shadows in this time", says O'Malley. "You have a lot of Catholic figures, all of a sudden, to the forefront of politics in America and I suppose the most obvious figure you would look to in this regard would be Senator McCarthy." Being a staunch anti-communist and weekly mass-goer was in keeping with Senator Joseph McCarthy’s Irish American Catholic pedigree. His mother, Bridget (Tierney), was from Co Tipperary and his father, Timothy McCarthy, was the son of an Irish immigrant. A Republican Senator from the State of Wisconsin since 1947, McCarthy rose to national prominence in 1950, when he alleged that 205 communists and Soviet spies had infiltrated the US State Department. McCarthy continued to raise suspicions of communist activity in other branches of the Federal Government, universities, the film industry and other organisations. 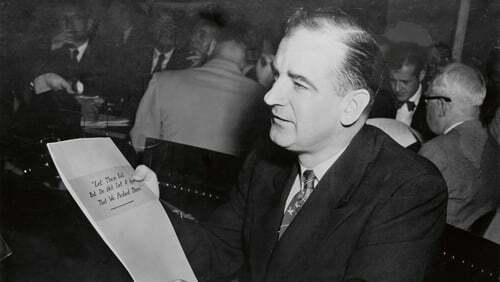 "McCarthyism" became the byword of aggressive anti-communism, unfounded defamation and mud-slinging. McCarthy himself embraced the term and used it in his 1952 book McCarthyism: The Fight For America. However, his attempts to investigate the US Armed Forces backfired and ultimately led him to be censured by the US Senate. "Senator McCarthy was a fascinating individual", according to O'Malley. "He was a Catholic obviously of Irish-American stock. And you have lots of investigations into hundreds of Americans who were being accused of being not just communists but communist sympathisers. And you have a lot of people informing on some of their work colleagues and people in their neighbourhoods. You have a real fear gripping America at this particular time." The Office of Strategic Services (OSS) led espionage and sabotage operations during the Second World War and was the precursor of the CIA, which was founded in 1947. The OSS was set up by Irish-American Catholic General William J Donovan, better known as "Wild Bill". He established a pattern of recruitment for intelligence work based on trusted personal recommendations – and it seems devout Catholic college graduates were high on his list. As that cadre of officers went on to run the CIA, it is perhaps not surprising that they recruited in their own image. In any case, the CIA earned itself nicknames like "Catholic Intelligence Agency" and "Catholics In Action." "The CIA has an image of being a WASP institution, very Ivy League, very east coast prep school", says WIlford. "All of that is true, yet there are a number of Catholics in the CIA as well, several of whom actually become Directors of Central Intelligence and run the organisation - John McCone is a Catholic, so too William Colby and Bill Casey. So there are many, many Catholics in this organisation."